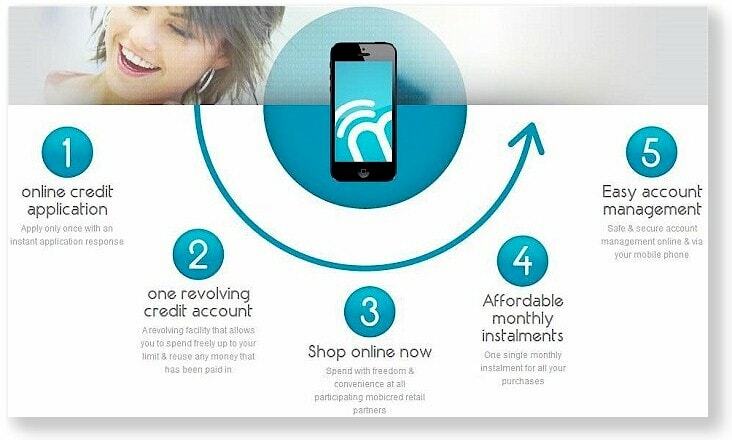 Get it on credit today with mobicred - a revolving credit facility for convenient online shopping! mobicred is a simple and convenient credit facility that allows you to pay in affordable monthly installments for products purchased online from Essential IT Solutions or any of the participating retailers. Register or login with us as usual. Select the item(s) you want to buy. Choose mobicred as a payment option. It will redirect you to their website where you will need to do a simple 2-step application. You will get an answer usually instantly. Once approved, navigate back to our website and continue your purchase. It's simple, convenient, secure and fast! Payments over 12 months at 23.20% per annum. The best part of all is that mobicred is revolving credit. So as soon you start paying back you will have more credit available to you to come back and buy more! Please note, fees are correct as in June 2018. You will be notified directly by mobicred about fee and interest rate changes. mobicred is an independent and authorised financial services provider.